Haven't run this for about 10 years - start/finish in Sefton Park. The course has changed somewhat. Are there any narrow sections on this new route? There are parts of the prom on the way back into town which are narrow but as it's near the end the field will have thinned out by then. And the final turns into the pier head are a bit tight too. Can't think of anywhere in particular which may cause any problems though. I've ran the last 4 or 5 years and it's easily the best local HM I think. 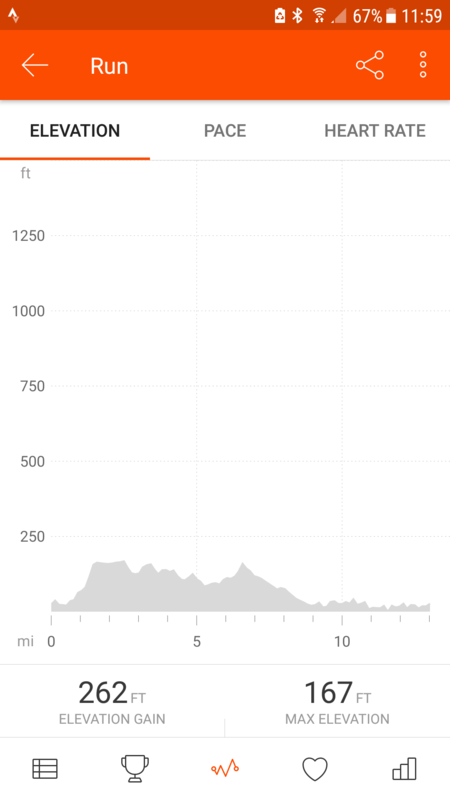 CSMLFC- As a veteran of the event.....looking at an elevation chart there looks to be a huge climb in the first mile or so? Also I've been told that the last 4 miles are always into a pretty hefty headwind? DT19-The first hill isn't too bad from memory,it's steep but short. When I did it 2 years ago we had the wind behind us the last few miles,it is down to which way it blows on the day,just have to hope it's in your favour. It's a short sharp incline up Parliament Street however good to keep your pace in check early on in the run! Impossible to say about the last 4 miles. Could be a headwind, coild be a tail wind, could be a cross wind or could be no wind whatsoever! I can cope with a very early hill. Ok thanks, that's helpful. I think I would prefer the tailwind option! Thanks, that looks pretty decent, especially if there is a tailwind in the last few miles.